Truth be told, I had never heard of it. I like my gadgets and what-not, but my PA was working just fine and it had knobs. I like knobs. Imagine my surprise when I actually won it! I had looked it up and saw that it hooked in with my iPhone/iPad and I could mix from wherever I was standing on stage; needless to say I was pretty excited to try it out, but I wasn’t prepared for how much it would improve my life (and our sound). I immediately bought the little bag that goes with the ProDX because traveling around – I’m clearly going to drop it at some point. With the little travel bag, I can put it in my luggage or in with the mic cables. It’s tiny and fits almost anywhere. To set it up is beyond easy – mic cables go in 1 thru 8, there are 2 main speaker outs and monitor 1 and monitor 2 outs so you can have two (!) separate monitor mixes. The App Store provided the ProDX Mackie Mixer Connect app, a quick hop over to Settings> Bluetooth> Connect and I was in business. Did I mention it was easy? One of my favorite features of the ProDX8 is the sweepable mid controls. Some PA’s only have high, mid and low controls but with the ProDX, dialing in acoustic guitars and vocals took just seconds. I crank the mids and sweep until I find the “ugly frequency” (you know the one) and then scoop it out. Couple this with a loop pedal on my acoustic guitar and I can easily go out front and soundcheck myself. The control freak in me loves this! Imagine setting up your PA, unmuting it and having it instantly ready to go. When we tour we often have 3 vocals, 3 acoustic inputs and a Porchboard bass kick pedal, so being able to save your settings and recall them whenever you want is brilliant. Different venues may need a little touch of different EQ or reverb but your starting point is already there. I’m typically not a fan of proprietary power supplies but when I wrote to Mackie to ask about 110 vs 220 volts they informed me that they make a European power supply for it and it’s only about $15 – so I was pretty stoked. If I was to complain about one thing it would be the lack of phantom power on the unit, but really that’s only a minor concern as most of the time you’d be using dynamic mics on stage, anyway. Hands down – coolest new piece of gear I have worked with in a long time. The interface is easy to use and its small size makes traveling a breeze. With the ProDX8 I can plug into any powered speaker combo I encounter, giving me full control over my live sound and making it sound great in any situation, whether I’m performing as a solo troubadour guy or with a full band. 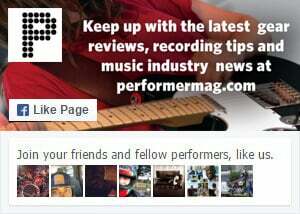 Thanks, Mackie and Performer Magazine! Follow The Fallen Stars on Twitter @TheFallenStars and learn more about the entire range of Mackie pro audio gear at Mackie.com.